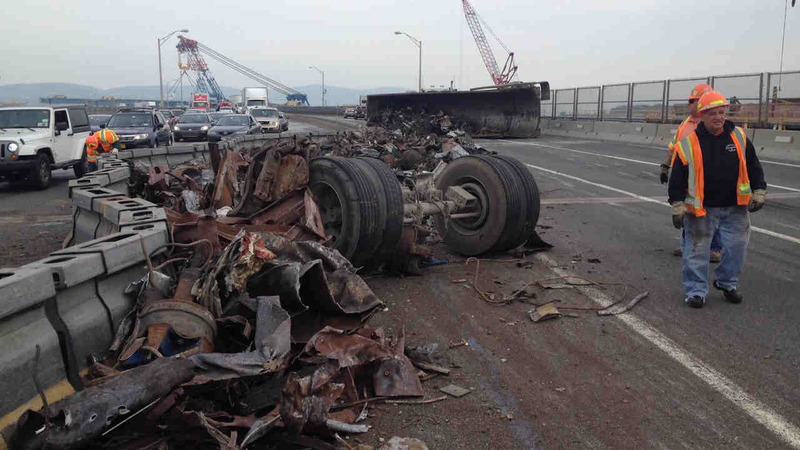 TARRYTOWN, New York (WABC) -- All lanes are open again on the Tappan Zee Bridge after a tractor trailer overturned and spilled debris on the roadway Friday morning, snarling traffic for hours. The incident happened at the height of the morning rush, temporarily closing all lanes in both directions after the truck lost its load of scrap metal. The driver of the dump truck was not injured, according to the New York State Police, but lane closures persisted until the mid-afternoon hours. Traffic backups and rubbernecking delays were said to be extensive during the cleanup, and authorities were hoping for a normal evening commute.